Successfully detaching the ‘hoof’ tag from his name has manifested itself in several years at the deliciously named Hamarkameratene (HamKam), and to where he is now, F.C. København. Obviously, managing these two clubs are not enough to disassociate with the Wimbledon insignia, Ståle needed to do something distract. No, it wasn’t bring Vinnie Jones from the emotionally vacuous hills of Hollywood to Copenhagen; but to create a team sprinkled with the qualities shown as a player; intelligence and enthusiasm. FCK’s vertebra is a 4-4-2, from which different systems can evolve. As well as being professional footballers, the FCK team are all contortionists, capable of flexing into an array of systems faster than the time it takes for Victor Valdes to knock out Dame N’Doye. Within the first twenty minutes against Barcelona, FCK had recited the tactical hymnbook and then some. Well, that is a slight exaggeration, but the understanding and implementation of a variety of systems is remarkable. Sketching from a powder consisting of a 4-4-2, FCK transform from a lifelike 4-4-2 to abstract Dali-esque systems. Away at Panathinaikos, a game won by the Danish champions-select 2-0, FCK showed the sort of flexibility that causes Paul Daniels to marry. From a rigid ‘two banks of four’ without the ball, FCK transform into a fluid attacking contraption that manifests in a variety of systems on the pitch. FCK without the ball - a narrow and compact 4-4-2. A sight more common than a Kerry Katona drug scandal is that of FCK’s right-midfielder, customarily the Costa Rican Christian Bolaños tucking extremely narrow, allowing for the right-back Zdeněk Pospěch to venture forward. Not too interesting you say? Well, yes – you would be right. However, these full-backs have a propensity to get forward matched by perhaps only Dani Alves. Often Zdeněk Pospěch was the farthest player forward, with Oscar Wendt often being not far behind him on the opposite site. This fits with FCK’s strategy off the ball, which is to stay compact and win the ball back through interceptions. As Barcelona discovered, it is difficult to break FCK down, defensively, they are very well organised. When they win the ball back, it requires players to make space to stretch the pitch so they can subsequently move the ball out of their defensive third. Full-backs are quite often the players with the largest amount of space available to move into, making it understandable that Wendt and Pospěch are often the most passed-to players over ninety minutes. The full-backs desire of space means Bolaños and Martin Vingaard find themselves in central areas quite often, resulting in a 4-2-2-2 shape. Another factor that needs to be illustrated is Dame N’Doye’s tendency to drop deep and hold up the ball. This allowed Bolaños and Grønkjær to move centrally and look for balls beyond the defensive line. 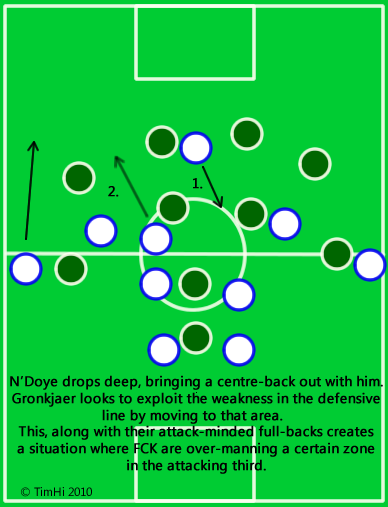 The rationale behind such movement is to expectantly draw central defenders further up the field to find space behind the opposition centre-backs. The movement of Grønkjær is interesting, as he is not used as a traditional second-striker who looks to really create behind N’Doye, but he rather looks to move into the channels or even wider. The once most-expensive Danish football player looks to move in accordance to which centre-back N’Doye has pulled out of position. This creates a position where FCK outnumber the opposition in a certain zone in one area of the pitch. If FCK do not exploit this outnumbering of opposition through the creation of a goalscoring opportunity, FCK’s compact midfield allows them the option to move the ball back and retain possession. This brief look into FCK illustrates the flexibility of Ståle Solbakken’s side. They don’t just have two tactical dichotomies, a plan for one set of instances and a plan for another, both mutually exclusive and unable to work in tandem. 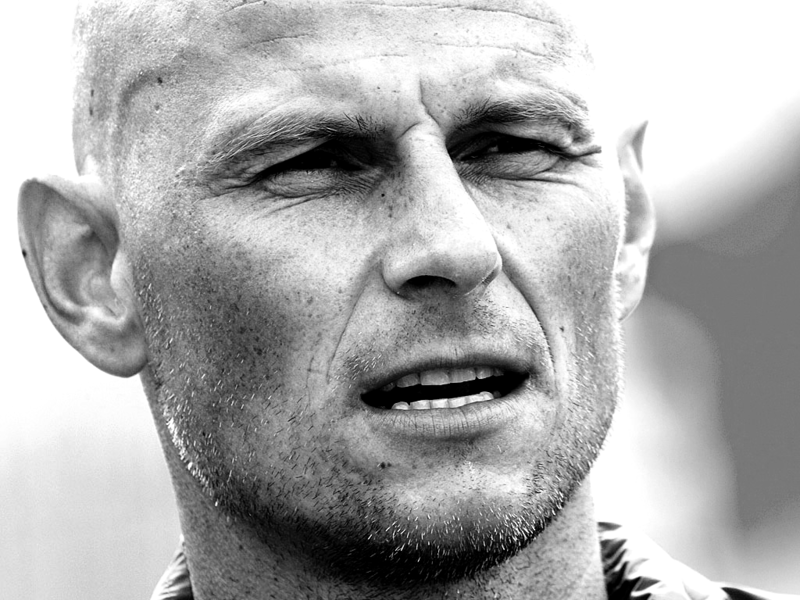 Solbakken has conceived a team that is comfortable forming several shapes when in possession, able to change their playing style dependent on the shape of the match and ball position. Not to forget the strangest formation of all time, the 4-4-2 from last season, where they played without a right winger. Where William Kvist played out wide right when defending but moved inside as a DMC in posession, with Atiba Hutchinson pushed forward as a AMC. I always thought it unfair to tag the old Wimbledon FC as solely a primitive long-ball team.They were coached for several years by Terry Burton and before that by Don Howe.With that coaching expertise it is not surprising that Stale Solbakken has picked u some good ideas. Thanks. I enjoyed your article. Was trying to figure out what his team was doing, tactically, against Barca.